Often times, we think that our dream jobs are only made-for-tv. For those of us who have dreamed of working in the magazine industry, we often fear that characters like Jennifer Garner in 13 going on 30 or the loveable Andy (played by Anne Hathaway) in The Devil Wears Prada are just that—characters. However, such dreams do come true with hard work. The Spread had the opportunity to sit down with Anna Hecht, a senior in News-Editorial Journalism who has lived out her dream internship aspirations and is now ready to enter the magazine industry head-on. She has interned for publications such as InStyle and Fitness Magazine, while also managing to stay busy on campus by involving herself in various organizations and maintaining a high GPA. Our person of the month Anna is everything any young person in magazine journalism would aspire to be, and she shares her experiences with us so that others will follow her lead. The summer following my sophomore year, I interned at People StyleWatch magazine, which was the most amazing experience. It was my dream to work in a fashion magazine in NYC. The way I got it was there was a woman named Charla Krupp [who] went to the U of I and she was huge in the industry. She helped start InStyle magazine and she was on the TODAY show more than 100 times. She was amazing. She unfortunately died of breast cancer when she was 58. I was the first recipient of the scholarship her family left behind, and I happened to be placed at People StyleWatch. I did a lot of fact-checking where I was constantly calling a lot of PR people and checking credits. I also got to do a little writing for People Magazine online which was amazing. It’s crazy, but that August I was supposed to come back and start school my junior year on a Friday and I ended up finding out on the Wednesday before that I had gotten the internship at InStyle, so I was going to be staying in NYC through the fall. I remember that Thursday, the intern coordinator at InStyle called me, and there’s no warm and fuzzy in the fashion industry. It’s like “Hey Anna can you start Monday at 9 a.m.?” and no other questions asked. I had to withdraw from the university within twenty minutes and I just had to make that decision to be in New York for the fall. This past summer, I worked at Fitness Magazine, which was definitely my favorite internship because I got to write every day and the team was so awesome and fun. 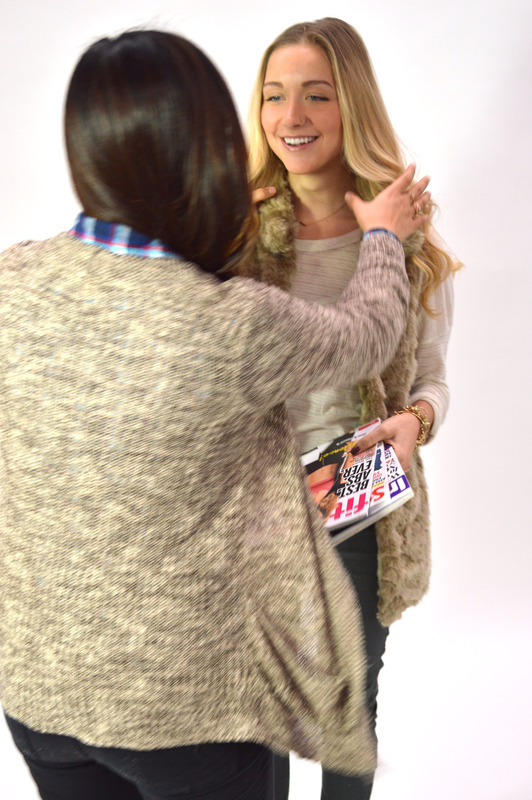 Tell us about your decision making process behind taking a semester off to work at InStyle. I know you said you made your decision in twenty minutes, but did you think about it deeper than that? It’s kind of crazy. I remember I had just reached out to the internship coordinator at InStyle [telling them] if they had anything in the spring or summer I would be more than willing to work with them. She emailed me back asking if I wanted to start that following Monday, but in my mind I was thinking about coming back to school. At the time, I was the Vice President of [Public Relations Student Society of America], I was the head photographer for Her Campus, and I was the Public Relations person for my sorority. I was like, how am I going to get out of all these things in a matter of three days and not leave anybody hanging? At first, my initial reaction was no I can’t do that but then after a few minutes of thinking it over, I was like that would be so stupid to give this up because that was exactly what I had been working for back at campus. I called my mom and walked around my building, and I thought it was totally worth it. I decided to do the interview the next day, and then I found out two days later I got the internship. Did you enjoy living in the Big Apple? Out of all of the cities I’ve visited, NYC is by far my favorite. Ever since I was in junior high school, I dreamed of living in New York City to pursue magazine journalism. I love everything about it: the place, the sites, the diversity, the shopping, everything! What was the first step you took towards your writing career? How did you get started? Freshman year I just wanted to get involved in anything I could, so I started writing for Her Campus. I always kind of avoided The Daily Illini, even though I’m the creative director there now and I love it. I just always wanted to do anything fashion and magazine related so I worked as an Editorial Assistant and videographer at Impulse [magazine]. I worked for this national online [publication] called College Magazine, and I just wrote anything that I could get my hands on that was fashion related or lifestyle and design, and then I somehow worked my way up to People Stylewatch. J.A.MS president and Anna’s close friend Angela steps in to make sure Anna looks fabulous during her shoot with The Spread. Coming to U of I as a freshman, did you ever imagine it would be like this? No. I was always really hard working, and obviously that was my dream. I’m kind of crazy, I’m not going to lie [laughs], but I’m really passionate about whatever I do. I always knew I was going to find a way to do something that made me happy, but I never knew it would play out like this. I’m always doing a million things and I can’t say no to anybody, but I never think realistically about my schedule, ever. When people ask me to do something and I think it sounds cool and I’m curious about it, I take it on, no matter what. So now I’m working sixty hours a week and doing twenty hours of classes, but I just wear a lot of under-eye makeup and smile. I think that what kind of led me to where I am. I remember in high school watching Lauren Conrad on The Hills and [seeing] her at Teen Vogue. I was like “Dad, I have to do that” and that was my dream. I still can’t believe it. It feels like I’m talking about someone else’s life when I talk about my internships because it still doesn’t seem real to me. What’s your next step after graduation in May? The thing that scares me the most when people say “What’s your next step?” I’m a planner, but in this industry you really can’t plan. In magazines and anything fashion related they’ll post the jobs, and then they’re down within like three days, so you’ll probably find out a week before that you’re going to be moving to NYC and starting a job. My next step right now is I’m going back to Fitness Magazine over winter break, just to kind of be there and stay relevant with the company. I’ll be back at school for the spring semester to hopefully start applying for jobs in like March or April and I’ll send out emails to all the editors like “Hey, I still exist! I’m graduating please hire me!” [laughs]. Can you give our reader a bit of advice on how they can achieve such an extensive resume like yours, especially if a freshman is reading this? You’re in college, and yes your grades matter, but try to take on as much as you can outside of school. Life isn’t as structured as many of your classes, so you should get into a lot of outside experiences where you have to manage your own time and you have to decide what is important and what you want to pursue and what projects make you excited. Just do as much as you can and make as many connections as you can. Always be on time and meet your deadlines. Your reputation spreads really fast in the College of Media; people either know you’re really good or you never follow through. Make sure you’re taking on things you’re passionate about so you’re not putting them off and not following through with things. I know a lot of people look at me like I’m crazy when I say [this], but you really should take on as many opportunities as you possibly can. It’s all crazy until it’s done and published, but when it finally is, you can take a sigh of relief and when you’re really proud of something, that’s the best feeling. I think it’s worth it. You can sleep when you graduate. Last question: Chicago deep-dish or New York-style Pizza? [Sighs] I always get into fights with people in New York about that. I would have to say Chicago deep-dish. I’m not loyal to Chicago in any way because I didn’t grow up there so I feel like I at least have to let Chicago win that one and choose deep-dish. People in New York always say New York-style is better, but I feel like that’s the one thing that Chicago has on New York. Otherwise, New York wins. You can check out all of Anna’s work at annahecht.com. Take note people, Anna will be a star one day!